A consideration of the development of the concept of “race” and the ways in which American academics have dealt with and teach about both race, racism and intergroup relations. The latter is based on a nationwide study of undergraduate courses and the varied approaches of those who taught about those issues and such related ones as prejudice, discrimination, and minority responses, circa 1965. Here are two fascinating little monographs in one small book. 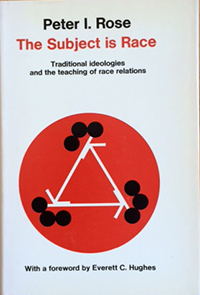 …The first eighty pages are a history and analysis of the development of sociological thought about race. Rose does not limit himself to a discussion of the work of those sociologists who specialized in race relations. He tries to show the impact on the sociology of race of various theoretical developments in the history of sociological thought. At the same time he demonstrates that both intellectual and political interest in race and racism have influenced the development of more general sociological theory. The first half of the book, then, constitutes the natural history of an academic specialty. Peter I. Rose brings much public and academic experience to the important subject of race. He has been a consultant to the Anti-Defamation League since 1960, and, in 1964, published They and We, a concise account and critique of what sociologists and other social scientists have learned about minorities, prejudice, discrimination, and the reaction of the minorities involved….The work under review also discusses and problems the existence of prejudice and discrimination from ancient days to the present…and a nationwide survey of courses taught on the subject. ….Of the many findings listed and described in the survey [with responses from 1724 institutions of higher education in the U.S.] the following are perhaps the most significant to a sociologist: 1. Instructors still persist in concentrating on American society in most instances with an ethnocentric and melioristic perspective and an “aura of scientific certainty as well as an undercurrent of moral indignation….” 2. The deficiencies in such courses were inadequate reference or handling of sociological concepts, sketchy treatment or too little time spent with the history of intergroup relations, an absence of the anthropological and psychological approach to thesee phenomena, and, finally, an overemphasis on American materials and illustrations. This is an apropos work on a timely subject.